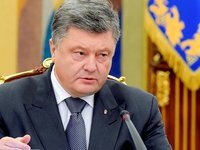 Ukrainian President Petro Poroshenko says the end of the occupation of Crimea will remain his priority after the presidential election. "I want to say that my first priority, immediately after the elections, will be the Crimean issue," he said in an interview to Ukrainian television channels on Wednesday. He says retaking Crimea is a matter of principle for him. "We are not going to trade Crimea, as someone does. We are not going to say that Crimea is something to be addressed later. Crimea will be one of the first items on the agenda," he said. According to the president, sanctions against the Russian Federation over Russian aggression against Ukraine and claims filed by Ukraine against Russia in international courts will be conductive to the end of the Russian occupation of Crimea.